this was the scene of her dying, in near time i didnt watch such a sad scene with so beautiful "going away"
For me? For real? Do you know how suprised I am? OMG! You're fast! I wonder how long it takes for you to make a wall. LOL. 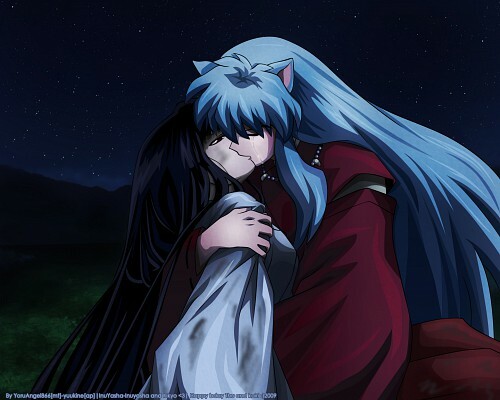 Inu Yasha kissed Kikyo! It's beautiful yet so sad! Simple and clean wallie~~ Good job Yoru-sama. DANG, too bad it's not kagome! haha, anyways - really awesome! I love Kikyo so much, this is a wonderful dedication to this tragic couple. I love the shadows and texture. I wish the sky had more clouds or some soul lights in the air, for better atmosphere. Beautiful wallpaper indeed!And it express very very good the tragedy of that scene. I love it, great work! *. * Kikyo~~~~~~ XD, really nice wallpaper. I don't really support this couple anymore, but I still love kikyo's character! Really beautiful wall, although the eye stands out a bit. I only watched up to where the 1st part of the anime stopped and skipped through the manga scenes to see kikyo xD. its such a perfect wall, dont have words... i love this couple x3 the colors, the tears, the night... everything seens great ^^ awesome job! wonderful wall. that scene seriously made me cry ): it makes me wonder why so many people hate kikyo. it's sad, really. T_T this scene really brought tears in my eyes. I has a big lump in my throat when Inuyasha kissed her. I love Kikyou so so much.